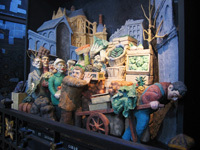 Henri IV was the king of France from 1589 to 1610, right up until he went and got himself assassinated in broad daylight in the middle of Paris, in the bustling neighborhood known as Les Halles. A guy named François Ravaillac ran up to Henri's coach while it was stuck in traffic and stabbed him to death. I'm no historian so I'll let you Wikipedia the story if you're interested. 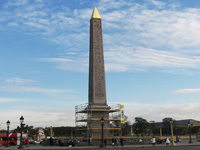 There are two different sights to check out that mark the place where Henri IV was killed. 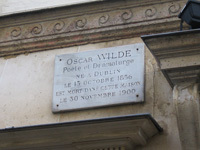 Both are located on the Rue de la Ferronnerie (map), with one a few dozen paces away from the other. First, there's this plaque on the wall commemorating the assassination. 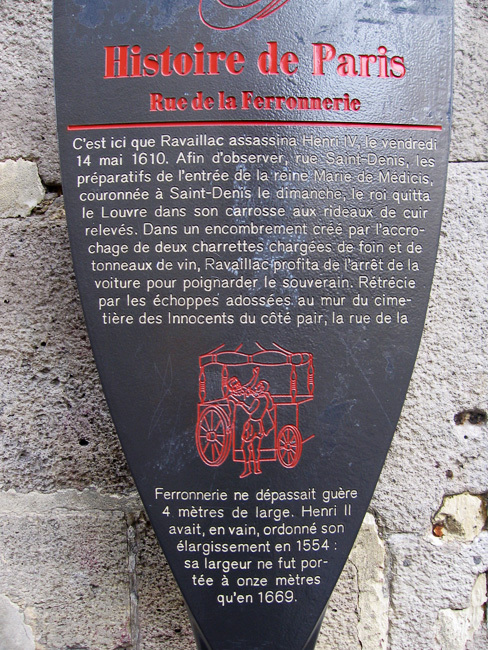 It says, "In this place, King Henri IV was assassinated by Ravaillac on May 14, 1610." However, a ways down the street there's a symbol on the sidewalk that supposedly marks the exact spot where ol' Hank's coach was when he got shivved. Here you can see both the plaque up above and the Histoire de Paris sign at the far left. (Bonus, there's a little pixel monster mosaic on the right!) 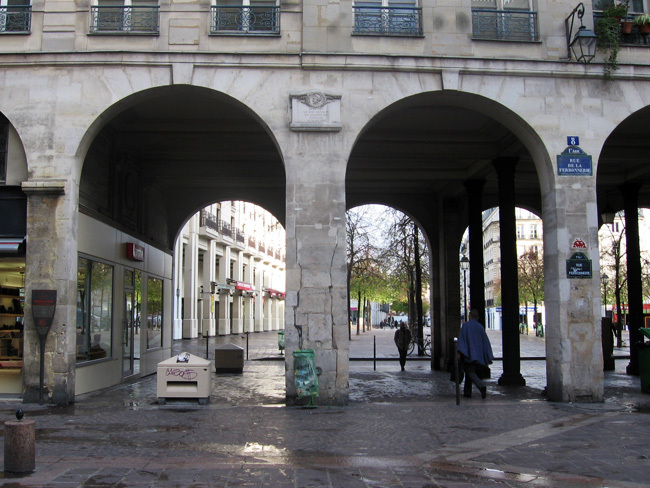 From the angle of this photo, the Fontaine des Innocents is just beyond those arches and off to the right, and the Forum des Halles (that big shopping mall) is way in the background behind those trees at center. You're basically pointed North here. Those arches are pretty easy to spot, so look for those and you can put yourself in the right place to see all this stuff. That's the place! 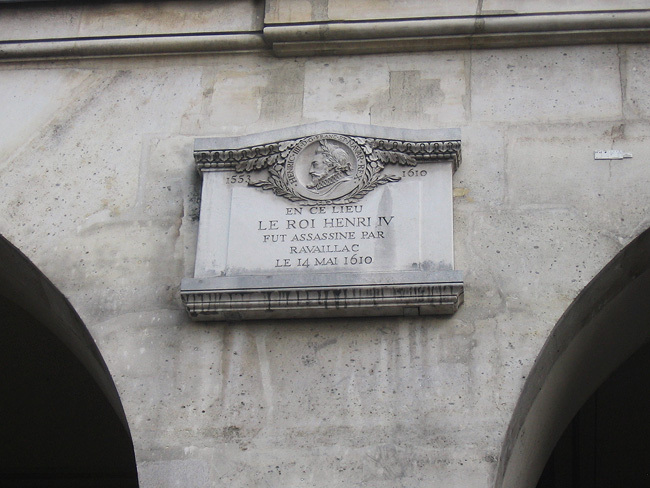 I've visited this spot several times, and I never even noticed until I looked at my photo at home that the name "HENRY IV" (the name Henri was spelled with a Y in the middle French of the early 17th century) is written above the image, in barely-visible gray on gray. The symbol is fairly large; about a meter and a half squared, I think. Here's a link to the Google Maps street view, for some context; the symbol appears very faded here but it's right there in front of you in that diamond shape. 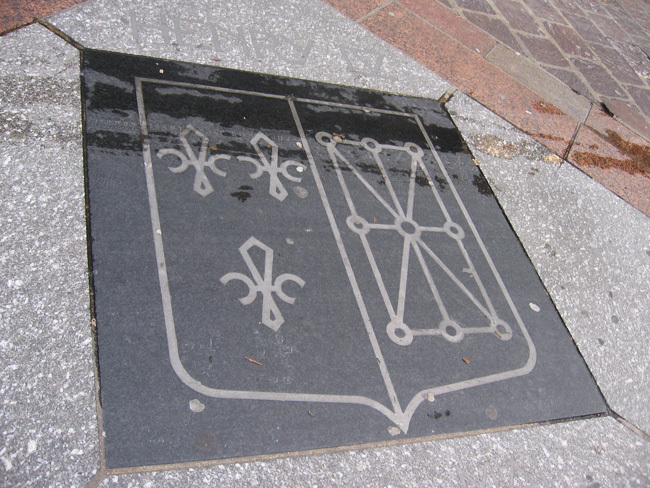 It's strange to find this symbol marking such an historic and morbid event and see that it's on a tiny street lined with boutiques and touristy cafes, and dozens of people are stomping right over it, not noticing it or knowing that royal blood was spilled here. 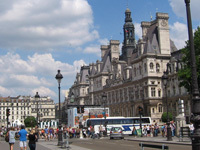 As for François Ravaillac, he was captured, imprisoned, tortured, and finally executed a couple weeks after the murder: on May 27 he was drawn and quartered  that is, pulled apart by four horses  at the Place de Grève in front of L'Hôtel de Ville (see my article, L'Hôtel de Ville  a great place for an execution! ). The great scholar Wikipedia had this to say about the execution, "Before being drawn and quartered... [Ravaillac] was scalded with burning sulphur, molten lead and boiling oil and resin, his flesh then being torn by pincers." Yikes. By the way, this is pretty unrelated, but when you're facing the plaque, just a couple streets behind you is a pest control shop with a front window full of dozens of dead rats that you might want to check out as well! 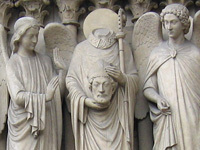 If you're a fan of history and gruesome stuff, all these spots are worth visting! Enjoy! 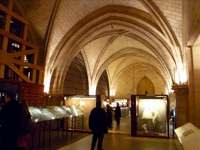 Site of the guillotine after the Revolution. Former prison where Marie Antoinette awaited the guillotine.